A critical editorial published by Canada’s leading medical journal is the latest move a mounting effort to convince the federal government to crack down on the sale of caffeinated energy drinks to minors. Energy drinks that contain high amounts of caffeine – some more than five times the amount in a can of cola, or nearly double the amount in a cup of brewed coffee – can pose serious health risks to children and adolescents and require stronger warning labels, according to the Canadian Medical Association Journal’s editorial. The editorial comes as an increasing number of health experts and consumer advocates are urging action. The Medical Society of Prince Edward Island has been pushing for the province to restrict the sale of caffeinated energy drinks to young people. The House of Commons health committee has also been investigating the use of caffeine in energy drinks and other carbonated beverages. In June, it heard from a man named James Shepherd who said his 15-year-old son died from an unexplained arrhythmia (irregular heartbeat) in 2008 after he had consumed a Red Bull energy drink. He said he believes the drink contributed to his son’s death. Chris Turner, Health Canada’s director-general of the marketed health products directorate, said the department has received several dozen reports of adverse reactions linked to energy drinks, and that 15 of them were cardiac events. Red Bull is one well known example of a caffeinated energy drink. But as the market has exploded in recent years, a growing number of products that deliver high levels of caffeine are available. Unlike cola drinks or similar carbonated beverages, energy drinks usually contain much higher levels of caffeine. For instance, a 250-ml bottle of Coca-Cola contains 26 milligrams of caffeine, according to the company’s web site. But a 75-ml bottle of Rockstar “energy shot” contains 200 mg of caffeine. A 355-ml can of Red Bull contains 113.6 mg of caffeine. Health Canada says children between 10 and 12 should not consume more than 85 mg of caffeine a day (children 4 to 6 should not exceed 45 mg, while those 7 to 9 should not exceed 62.5 mg). Healthy adults shouldn’t consume more than 400 mg a day, the department says. ([Saints See: More about energy drinks and kids - There was a lot of discussion this week about kids and teens consuming caffeinated energy drinks. The coverage was spurred on by an editorial in the Canadian Medical Association Journal calling for Health Canada to ban promotion of energy drinks to kids and teens and to make labelling clearer. Can kids buy Red Bull? One of the warnings on the Red Bull can says the product is "not recommended for children." But Red Bull is carried in corner stores (it's already a number one seller in 7-11's) and a group of 10-year-old kids we sent out had no problem buying the beverage. "Lots of kids are buying it but we can't control that," says Red Bull Canada's Jim Bailey. "If a parent allows their child to consume caffeine or coffee or Coke, I think it's really up to the parent to decide," he adds. "The retail sale is not part of Health Canada's jurisdiction," says Health Canada's Robin Marles. "It's the manufacturer and their responsibilities." He adds that Health Canada works "as much as we can to educate the public about appropriate use of products. But people have to take some responsibility themselves."] Job 36:13 But the hypocrites in heart heap up wrath: [Saints See: Energy Drinks: The New Gateway Drug? - I remember the days when the D.A.R.E officer would come into my school and warn about the dangers of smoking and drinking as they were the gateway drugs to hard illegal ones. It now appears that certain people are pushing to add energy drinks to the list. According to the LA Times, Roland Griffiths from John Hopkins University, has recently published a paper outlining the dangers of energy drink consumption. He also had 97 addiction experts sign the paper and then he sent it to the US Food and Drug Administration calling for federal regulation of energy drinks. He believes that energy drinks should be considered gateway drugs and that kids who consume them will be more likely to use illegal drugs in the future. ][Saints See: Monster energy drinks winning the caffeine wars - Energy drink sales are rising in the U.S. and the big winner is Monster, according to analysis by UBS analyst Kaumil Gajrawala. Hansen Natural Corp., the California-based parent company of Monster energy drinks, is taking market share from energy drinks owned by Coca-Cola and PepsiCo. Energy drink sales rose 7.6 percent in the four weeks leading up to July 10, while Hansen's sales rose 14.8 percent, according to Nielsen data. That was an acceleration for Hansen. The data only represent about 25 percent of sales, but recent checks indicate the convenience store numbers "should also show Monster strength," Gajrawala wrote Thursday in a note to clients. It doesn’t have specific limits for teens because it says there is “insufficient data,” but recommends caffeine consumption for that group not exceed 2.5 mg per kilogram of body weight. Excessive caffeine consumption can lead to irritability, loss of sleep or nervousness. But there is also concern that its stimulating effects can cause rapid heat rate, an abnormal rhythm or other problems that could have serious health consequences. One of the major reasons for concern, according to the editorial, is that makers of energy drinks regularly target young consumers through event sponsorships and promotional materials. For instance, Rockstar sponsors off-road racing and extreme sports events. 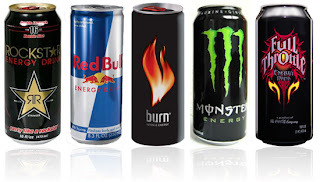 Health experts are also concerned by the fact many young people may mix energy drinks with alcohol, a potentially dangerous combination because the stimulating effects of caffeine can allow an individual to drink more over a longer period of time, which could lead to alcohol poisoning or risky behaviour. Caffeinated energy drinks are sold as natural health products in Canada. They must undergo a review to determine they are safe and effective and those that are approved have a licence number printed on their label, according to Health Canada spokesman Gary Holub. But since there is a major backlog of products to be reviewed and approved by Health Canada’s Natural Health Products Directorate, the government has allowed many to go on sale while waiting for approval. That could mean some energy drinks and other natural health products on the market have never been reviewed for efficacy or safety. To date, Health Canada has approved 18 energy drinks as natural health products, including eight varieties of Red Bull and six types of Full Throttle energy drinks. Red Bull and other companies that sell caffeinated energy drinks did not respond to requests for comment. Refreshments Canada, an industry association representing beverage makers, issued a statement saying companies that sell caffeinated energy drinks are responsible and don’t engage in marketing campaigns aimed at children. It states that energy drink labels clearly indicate the products should not be consumed by children and that the products have been approved for sale in more than 100 countries. It also sent a letter to Dr. Hébert stating the CMAJ’s editorial wrongly insinuates that energy drink makers target youth or are unregulated. “Energy drinks are intended for adults and clearly indicate on the label that this category of beverage is not recommended for children, pregnant or breastfeeding women and people who are sensitive to caffeine,” Refreshments Canada president Justin Sherwood said in the letter. Great! But of course, energy drinks are not for kids. My Verve energy Drink does not allow me to let my child drink it as it can damage their system and it is not for them though.